Connections matter. People give to causes for a lot of reasons, but pure philanthropic spirit isn’t one of them. They give because they get a personal benefit from a charity (like funding a theater effort); because the charity benefits someone they care about, or because they get recognized for supporting something that others think is important (like pinkwashing the NFL). Your charitable cause is up against a zillion others doing amazing work. What connects your donor to this particular giving? The personal ask matters. Freakonomics uses the example of a scout selling door-to-door. If scouting itself was the only thing that mattered, people would just donate some cash or even seek out the charity. The cookie (or popcorn or whatever) sale is much more about being in front of someone who then has a much more difficult choice to make in saying no, and so they end up contributing because the personal connection – even to a kid you’ve never met at your door – is enough to push a donor over the edge. Swag matters. Of course donors often give to a charity and don’t get “things” in return (see point one on connections – they get immaterial things). However, people will give, or sometimes give more, if there is a cool thing as incentive, or even the chance of a cool thing. In the case of Freakonomics, donors can get swag if they give at certain levels. All donors get the chance to win a trip to New York. Matching gifts fall into the swag category, even though the donor doesn’t get them. They have the effect of incenting more contributions by creating a sense of extra value. Where Freakonomics missed here – and host Stephen Dubner talks about this in the episode – is a chance to define their Nonprofitiness™. Dubner talks about what happens to the podcast if people don’t contribute, and has to confess that nothing awful will happen immediately. “No kittens will be killed,” and the show will go on, for a while anyway. It’s okay to own that terrible things won’t happen without charitable contributions tomorrow . If so, why are you asking for money? 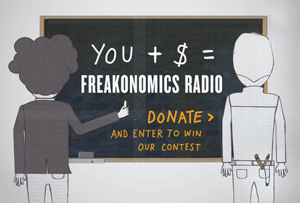 Freakonomics has sponsors, they sell books – why do they need donations? Lay it on the line and help your supporters understand. Sure, a trip to New York would be awesome, but how about a trip to New York and some compelling reasons to be a financial contributor to the thing they love? Cohost Steven Levitt expresses his skepticism people will give early on, but then goes on to make a good start at the Nonprofitiness™ of Freakonomics. Develop that thought, and share it. Your audience knows you do good work, now tell us why you need our money. PS – Apologies to Missy Elliott for the post title.